The creations within the gallery are a result of a relationship built between students Rodrigo Marti and Felicia Montes in conjunction with Homies Unidos, a gang intervention program in the Pico Union area of Los Angeles and We Are Alex, the ad hoc committee that was formed after Homies Unido’s director Alex Sanchez was incarcerated and faced dubious judicial proceedings. Marti and Montes realized the importance of expanding Homies Unidos and We Are Alex’s networks in order to increase the visibility of both organizations. They began with the creation of an art program based on themes of identity and culture focusing on issues of personal space, and urban life in relation to international issues, focusing specifically on the histories of conflict among various discriminated populations. The creative outcomes are varied and include a panel discussion or conversation based on youth and gang intervention work and the prison industrial complex, extending the organizations’ messages through a poster campaign and bicycle spoke card distribution, and a guerilla theatre piece created by Homies Unidos Program Coordinator Alejandro Alvarado. Montes feels especially connected with the organization as a Chicana from East L.A. who has worked with various similar underserved populations for the past 13 years. Her life’s work and creations deal with the interconnected issues of the communities within Homies Unidos and We Are Alex including identity, immigration, culture, and community. She hopes this creative energy and its manifestations can free Alex and all political prisoners and activate artists and community to create change. 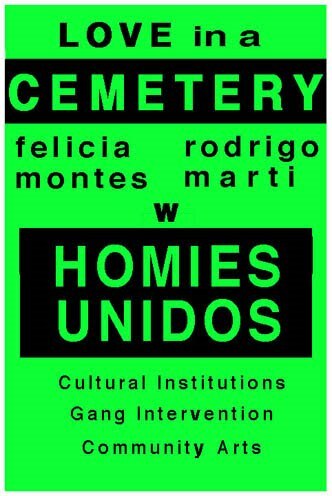 A new arrival to Los Angeles, Marti was initially drawn to the project when learning of the stresses caused by the Alex Sanchez case on not only Homies Unidos, but also the wider gang-intervention community. Allegiances and friendships built through this project have been invaluable to understanding their unique history and the long struggle for (im)migrant rights.